Salvador, also known as São Salvador, Salvador de Bahia, and Salvador da Bahia ([sawvaˈdoʁ da baˈi.ɐ]), is the capital of the Brazilian state of Bahia. With 2.9 million people , it is the largest city proper in the Northeast Region and the 3rd-largest city proper in the country, after São Paulo and Rio de Janeiro. Salvador forms the heart of the Recôncavo, Bahia's rich agricultural and industrial maritime district, and continues to be a major Brazilian port. Its metropolitan area, housing 3,953,290 people (2015) forms the wealthiest one in Brazil's Northeast Region. 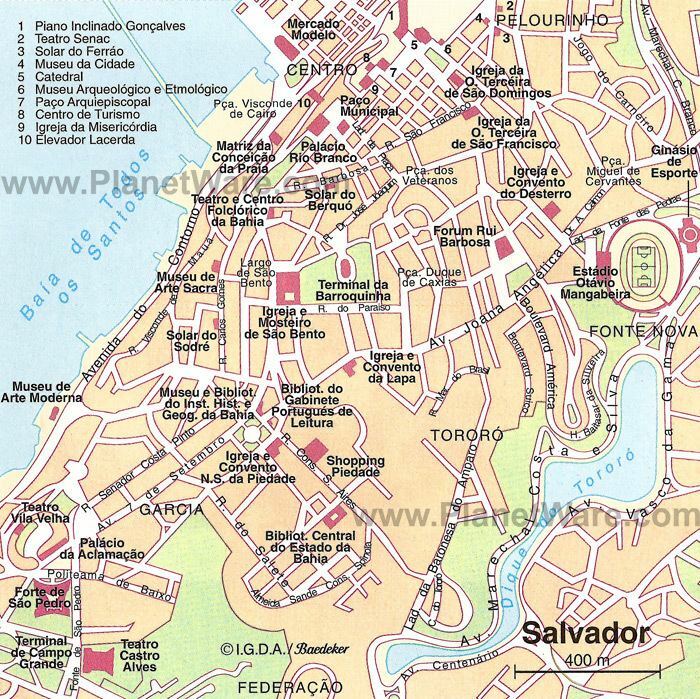 Salvador lies on a small, roughly triangular peninsula that separates the Bay of All Saints from the Atlantic Ocean. The bay is the largest in Brazil and the 2nd-largest in the world. It was first reached by Gaspar de Lemos in 1501, just one year after Cabral's purported discovery of Brazil. During his second voyage for Portugal, the Italian explorer Amerigo Vespucci sighted the bay on All Saints' Day (November 1) 1502 and, in honor of the date and his parish church in Florence, he named it the Bay of the Holy Savior of All the Saints. The first European to settle nearby was Diogo Álvares Correia ("Caramuru"), who was shipwrecked off the end of the peninsula in 1509. He lived among the Tupinambá, marrying Guaibimpara and others. In 1531, Martim Afonso de Sousa led an expedition from Mount St Paul (Morro de São Paulo) and, in 1534, Francisco Pereira Coutinho, the first captain of Bahia, established the settlement of Pereira in modern Salvador's Ladeira da Barra neighborhood. Mistreatment of the Tupinambá by the settlers caused them to turn hostile and the Portuguese were forced to flee to Porto Seguro c. 1546. An attempted restoration of the colony the next year ended in shipwreck and cannibalism. The present city was established as the fortress of São Salvador da Bahia de Todos os Santos ("Holy Savior of the Bay of All Saints") in 1549 by Portuguese settlers under Tomé de Sousa, Brazil's first governor-general. It is one of the oldest cities founded by Europeans in the Americas. From a cliff overlooking the Bay of All Saints, it served as Brazil's first capital and quickly became a major port for its slave trade and sugarcane industry. Salvador was long divided into an upper and a lower city, divided by a sharp escarpment some 85 meters (279 ft) high. The upper city formed the administrative, religious, and primary residential districts while the lower city was the commercial center, with a port and market. In the Catholic Church, Brazil and the rest of the Portuguese Empire were initially administered as part of the Diocese of Funchal in Portugal but, in 1551, Salvador became the seat of the first Catholic diocese erected in Brazil. The first parish church was the mud-and-thatch Church of Our Lady of Help (Igreja da Nossa Senhora da Ajuda) erected by the Jesuits, which served as the first cathedral of the diocese until the Jesuits finished construction of the original basilica on the Terreiro de Jesus in 1553. Its bishop was made independent of Lisbon at the request of King Pedro II in 1676; he served as the primate of Congo and Angola until the elevation of Luanda on 13 January 1844 and still serves as the national primate of Brazil. In 1572, the Governorate of Brazil was divided into the separate governorates of Bahia in the north and Rio de Janeiro in the south. These were reunited as Brazil six years later, then redivided from 1607 to 1613. By that time, Portugal had become united with Spain and was ruled from Madrid by its kings. In 1621, King Philip III replaced the Governorate of Brazil with the states of Brazil, still based in Salvador and now controlling the south, and the Maranhão, which was centered on São Luís and controlled what is now northern Brazil. As Spain was then prosecuting a war against the independence of the Dutch, the Dutch East and West India companies tried to conquer Brazil from them. Salvador played a strategically vital role against Dutch Brazil, but was captured and sacked by a West India Company fleet under Jacob Willekens and Piet Hein on 10 May 1624. Johan van Dorth administered the colony before his assassination, freeing its slaves. The city was recaptured by a Luso-Spanish fleet under Fadrique Álvarez de Toledo y Mendoza on 1 May 1625. John Maurice's two subsequent attempts to retake the town in April and May of 1638 were unsuccessful. In 1763, the colonial administration was removed to Rio de Janeiro and elevated to a viceroyalty. Salvador remained the heart of the Recôncavo, Bahia's rich agricultural maritime district, but was largely outside Brazil's early modernization. The area formed a center of royal support against Pedro I's declaration of independence on September 7, 1822. Its elites initially remained loyal to the Portuguese crown while rebels from Cachoeira besieged them for a year until finally receiving Portugal's surrender of the town on July 2, 1823, which is now celebrated as Bahia Independence Day. The local elite was similarly hesitant during Manuel Deodoro da Fonseca's coup that established the republic by in 1889. Owing to whales' use of the Bay of All Saints as a mating ground, Salvador became a large whaling port during the 19th century but the trade had already begun to fall off by the 1870s. Under the empire and republic, however, the town slowly began to industrialize. In 1873, Brazil's first elevator, the powerful hydraulic Elevador Lacerda, was constructed to connect the city's upper and lower towns. Having undergone several upgrades, it continues in use. By the First World War, it was joined by a second elevator and Salvador was connected to four railroads: the Bahia & Alagoinhas to Joazeiro, the Bahia Central, the Nazareth Tramway, and a short line to Santo Amaro. Its central districts and the major suburbs of Bomsim and Victoria were served by four streetcar lines, which had begun to electrify. It also served as a port of call for most steamship lines trading between Europe and South America. Salvador has a tropical rainforest climate (Köppen: Af) with no discernible dry season due to no month having an average rainfall of less than 60 mm. Temperatures are relatively constant throughout the course of the year. Salvador's driest month of the year is September, when the city receives on average 10 cm (4 in) of precipitation. Salvador's wettest months are between April and June when at least 20 cm (8 in) of rain falls during each of these four months. Salvador's population is the result of 500 years of miscegenation. The majority of the population has African, European and Native American roots. The African ancestry of the city is from Angola, Benin, Congo, Ethiopia, Nigeria, Senegal and Mozambique. These religious entities have been syncretised with some Catholic entities. For instance, Salvador's Feast of Bonfim, celebrated in January, is dedicated to both Our Lord of Bonfim (Jesus Christ) and Oxalá. 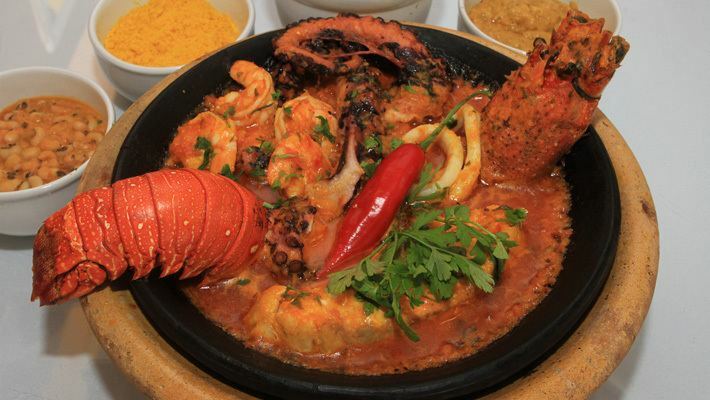 Another important feast is the Feast de Yemanja every 2 February, on the shores of the borough of Rio Vermelho in Salvador, on the day the church celebrates Our Lady of the Navigators. 8 December, Immaculate Conception Day for Catholics, is also commonly dedicated to Yemanja' with votive offerings made in the sea throughout the Brazilian coast. With its beaches, humid tropical climate, numerous up-to-date shopping malls (The Shopping Iguatemi was the first Shopping in Northeastern Brazil) and pleasant high-class residential areas, the city has much to offer its residents. There are international schools, such as the Pan American School of Bahia. 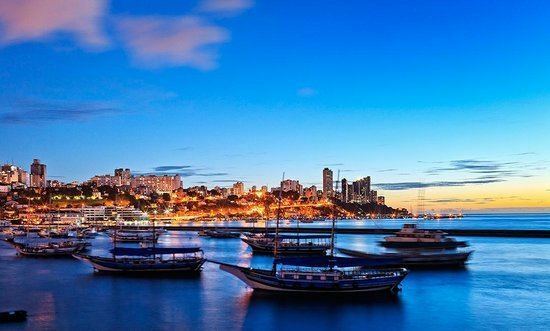 The crime rate of Salvador is statistically higher than other Brazilian cities, it has far more crimes than another touristic beach cities in south Brazil, such as Florianopolis, which is considered one of the safest cities in Brazil for tourism. ; it was also named the fourteenth most violent city in world. Salvador is home to the fourth most homicides of any city in Brazil, and this number increased 418% from 2000 to 2010. From 1998 to 2008, the number of homicides of youths between the ages of 15 and 24 increased 435.1%. Gun violence in the state of Bahia more than doubled in the period from 2004 to 2014, and the city ranks the top ten in gun violence of the 26 state capitals of Brazil. In 2014 the state of Bahia had the largest number of murderers in the country. At the same time, Salvador has one of the lowest rates of suicide in the country. Deputado Luís Eduardo Magalhães International Airport is located in an area of 6,900 square metres (74,271 sq ft) between sand dunes and native vegetation. The airport is located 28 km (17 mi) north of Downtown Salvador and the road to the airport has already become one of the city's main scenic attractions. With cargo volume that grows year after year following the same economic development rhythm implemented in the State, the Port of Salvador, located in the Bahia de Todos os Santos, holds status as the port with the highest movement of containers of the North/Northeast and the second-leading fruit exporter in Brazil. Salvador Metro System is in operation since 2014, and its 1st phase was ready since March 2008, between Lapa and Aceso Norte Stations, and in 2009 was ready the metro stations between Estação Accesso Norte and Pirajá. In December 2014 it opened until Retiro. In 2014 the system had 12.5 km (7.8 mi) and 8 stations and have link with the bus system. Salvador Metro system was one of the actions of urban mobility to the 2014 FIFA World Cup. The connection of Line 2 with Line 1 of Salvador Metro contributes to connect the International Airport to Downtown Salvador and the Fonte Nova Stadium. The new Line 2 of Salvador Metro integrates the metro stations of the Rótula do Abacaxi and the beach city of Lauro de Freitas in the metropolitan area, passing through the Salvador International Airport, with the Airport metro station. The bus station or Rodoviária of Salvador is located in Iguatemi district, with direct buses to larger cities in the country and to many destinations in the state of Bahia. On the second floor exixts the counters of the different bus companies, on the first floor there is a small supermarket and a 24 hours left luggage. Across the street there is a large shopping center, Iguatemi, with a food court, connected by a pedestrian crossing. Four paved highways connect the city to the national highway system. Running north from the Farol (lighthouse) de Itapoã are hundreds of miles of wonderful beaches. These beaches are accessible via the BA-099 Highway or (Line of Coconut and Green Line), a (toll) road, kept in excellent condition, running parallel to the coast, with access roads leading off to the coast itself. The road runs along dunes of snow-white sand, and the coast itself is an almost unbroken line of coconut palms. The communities along this coast range from fishing villages to Praia do Forte. The average amount of time people spend commuting with public transit in Salvador, for example to and from work, on a weekday is 94 min. 33% of public transit riders, ride for more than 2 hours every day. The average amount of time people wait at a stop or station for public transit is 33 min, while 70% of riders wait for over 20 minutes on average every day. The average distance people usually ride in a single trip with public transit is 8 km, while 18% travel for over 12 km in a single direction. A good way to get to know the old town Pelorinho is to explore the city with an English speaking guide. Salvador City Tour is offering privat day tours with English speaking guide. Salvador provides visitors and residents with various sport activities. The Fonte Nova Arena, also known as Estádio Octávio Mangabeira is a football stadium inaugurated on 28 January 1951 in Salvador, Bahia, with a maximum capacity of 66,080 people. The stadium has now been replaced with a new stadium named Itaipava Arena Fonte Nova with a capacity of 56,000 people. This stadium hosted matches of 2013 FIFA Confederations Cup and the subsequent 2014 FIFA World Cup, and will host football competition in the 2016 Summer Olympics. The stadium is owned by the Bahia government, and is the home ground of Esporte Clube Bahia. Its formal name honors Octávio Cavalcanti Mangabeira, a civil engineer, journalist, and former Bahia state governor from 1947 to 1954. The stadium is nicknamed Fonte Nova, because it is located at Ladeira das Fontes das Pedras. The stadium was in 2007 closed due to an accident, and the E.C. Bahia home matches now happen in another stadium, in Pituaçu. Dante Bonfim Costa Santos, professional footballer.